It has only been about a month since Samsung’s new flagship smartphone was released and already the Galaxy Note 8 market share has crossed 1 percent in many key markets. Many were initially concerned that the high price tag would deter some customers from purchasing this handset. That doesn’t appear to be the case so far. The Galaxy Note faithful have embraced Samsung’s new flagship phablet, giving the Galaxy Note 8 just the kind of response that Samsung would have liked to see after the Galaxy Note 7 fiasco last year. 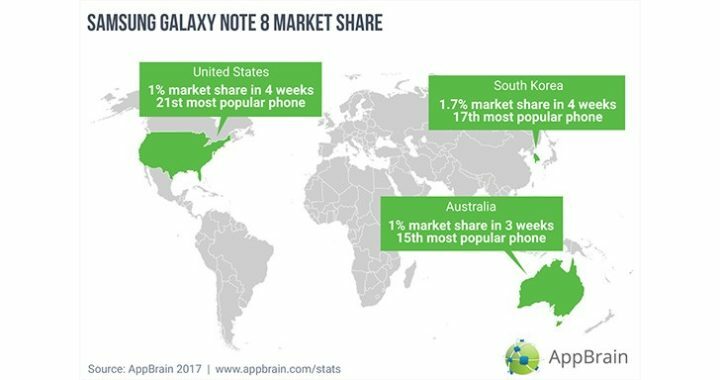 The latest stats by ad network AppBrain reveal that the Galaxy Note 8 market share has crossed 1 percent in several important markets. The Galaxy Note 8 now accounts for 1 percent of all Android smartphones in the United States, it’s the 21st most popular phone in the country. It took three weeks for the Galaxy Note 8 to achieve the same market share in Australia. After four weeks since launch, the Galaxy Note 8 now accounts for 1.7 percent of all Android devices in South Korea. The Galaxy Note 8 market share growth has been slow in Europe even though it was released there alongside the US and South Korea. That’s probably because Europe hasn’t seen an official phablet launch since the Galaxy Note 4. Samsung didn’t launch the Galaxy Note 5 there and we all know what happened with the Galaxy Note 7. For the sake of comparison, the Galaxy S8 and Galaxy S8+ have a combined market share of around 6 percent after being available for six months. The Galaxy Note 8 is certainly got off to a good start. It’s an impressive performance for what has been a device with a very specific group of users who make real use of the sPen as a work tool. Great to see others realizing it’s potential and that there is simply no equivalent in existence. The new way is much better in my opinion. One day in the future Google will be gone from Samsung phones, unless you want to download them.